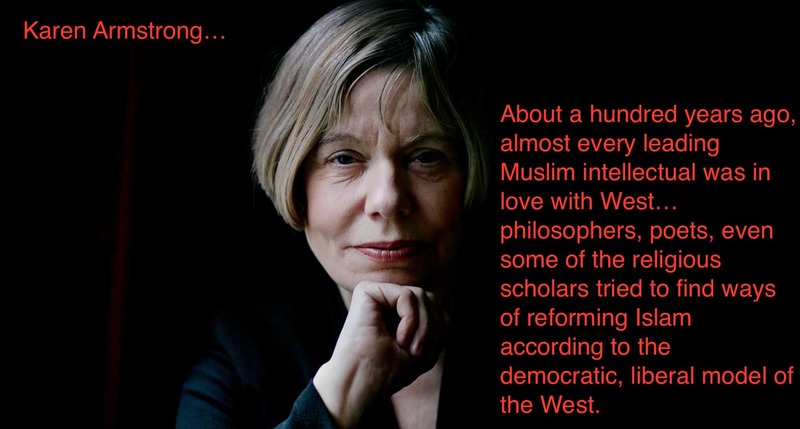 Karen Armstrong argues that there is no inherent incompatibility between the Western and Islamic world, but sees economic and political factors as the main reasons for increasing tensions in recent decades. Armstrong’s arguments can be used to criticise Huntington’s ‘Clash of Civlizations’ thesis, which sees increasing conflict between different cultures/ religions as an inevitable outcome of globalisation brining ‘incompatible’ civilizations into closer contact with each other. Armstrong points out that in the late 19th and early 20th century, most Muslim intellectuals looked up to the process of modernisation occurring in the West at that time, and wanted Islamic countries to become more like Britain and France. Some Islamic scholars even claimed that Britain and France were more Islamic than Islamic countries: Islam advocates the sharing of resources, and there was a trend towards this in so countries in early 20th Europe. Technological evolution moving countries beyond being agricultural, and making people less dependent on nature. Higher levels of education for the general populace. The development of the ‘modern spirit’ which involves more people engaging in politics, science and intellectual pursuits more generally. in many countries, the West backed autocratic leaders when it suited them (in return for access to oil supplies for example) and these leaders tended to deprive people of their human rights, suppressing freedom of speech for example. In Iran for example, the Shah Muhammad Reza Pahlavi was installed in power in 1953 in a coup supported by the American and British. He was a particularly ruthless leader who ordered a massacre in Tudeh Square in 1978 in which nearly 900 people were killed. He was overthrown the year after in the famous Islamic Revolution of 1979. Then in 1979 In Iraq, the British and Americans supported the installation of Saddam Hussein as a dictator, because he was hostile to Iran. A further effect of Western occupation was to increase divisions and inequalities: money derived from British oil companies for example tended to go to the minority of autocrats, and very little trickled down to the ordinary people. In fact there is something of a history of exploitation of poor workers by wealthy corporations operating in Islamic countries. Armstrong argues that the rise of Islamic Fundamentalism is a reaction against the nationalist and secularist ideologies imposed on them by the West, which basically failed the average citizen in Muslim countries. Fundamentalists believe they are fighting for their survival against a Western Imperialism that wants to wipe out Islam from existence. Armstrong believes that there is no reason why Islam cannot co-exist with the West, because most Muslims are not Fundamentalists and there is plenty of room for interpreting Islam as ‘being all about peace’. Armstrong isis thus more optimistic about the prospect of peaceful co-existence between religions when compared with Huntington. Haralambos and Holborn: Sociology Themes and Perspectives edition 8.